BABY I’M BEGGING: Tyrese DESPERATELY Wants His Woman Back—CLAIMS He Wrote ‘Black Rose’ For Her & Hates Coming Home To An Empty House! 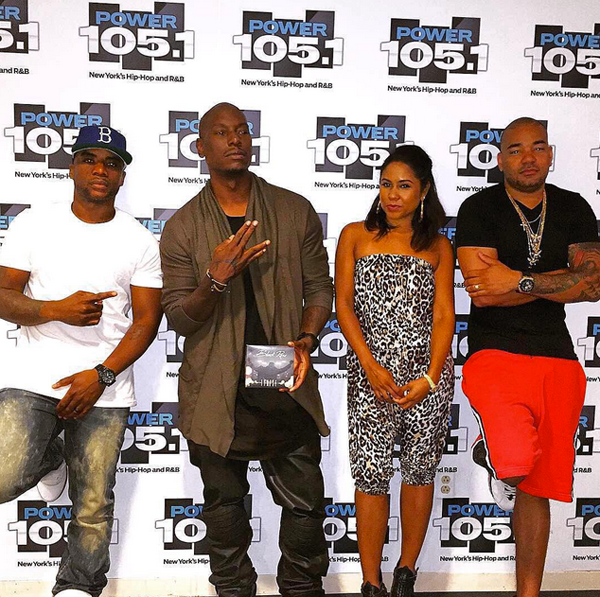 Tyrese has been on the promo trail something heavy for his newest album Black Rose. If you follow his Instagram, postings, you see he’s been doing a lot of grassroots marketing to promote his new LP, including singing on the bus and shooting mini videos with homeless people. On his quest for a No. 1 album (which is currently #1 in twelve countries), he has also been heavily participating in conventional forms of advertising, hosting meet and greets and doing interviews for radio and TV. So this morning, he stopped by Power 105’s The Breakfast Club to chop it up with the radio hosts about his sixth studio album, dubbing it his final LP. While chopping it up with the Breakfast Club hosts, he made it crystal clear this album (which by the way is independent) was written for the woman he spent the last five years in a relationship with, much like Robin Thicke did with his Paula LP to try and save his marriage with his now ex-wife Paula Patton. (Let’s hope, for Tyrese’s sake, he’s more successful than Robin). According to Ty, Black Rose will be his last album due to a judge granting him more custody with his daughter Shayla Gibson. He said he can’t be out in these streets weeks at a time after asking a judge to grant him more time with his daughter, so he decided to put fatherhood first and solely focus on continuing to build his special bond with his daughter. So what inspired Ty to release a new R&B album? He revealed he was in a relationship for over five years where he “effed” it up. He said he did some things he’s ashamed of and now he’s hoping to make it right. Later, he talked about pride and ego being the No. 1 relationship killer. So Ty has seen the light and wants his girl back…by any means necessary. Gotta do what you gotta do. In the interview, he also talks about racial barriers in the music industry (comparing how urban stations will play artists like Sam Smith & Justin Timberlake, but Pop stations won’t play his records), why R&B music is dying, and he talks about working with “Empire” star V. Bozeman through his Voltron label to help complete her debut album. So, we can probably put the dating rumors to rest. SIDEBAR- Tyrese will be guest starring on the upcoming season of “Empire” (Sept. 23rd). PREVIOUS: TOO FAST Or JUST RIGHT? Russell Wilson Gushes About Ciara -- "I Love Her To Death!"